Home About What is Nanoscience and Nanotechnology What is Nanoscale Science? Nanoscale science involves understanding the fundamental interactions of physical systems confined to nanoscale dimensions, and when matter is controlled at the nanoscale, fundamental properties of things like temperature, electricity, magnetism, and chemical reactions can change completely. The laws of classical physics describe our cosmic universe: the motions of the planets, the trajectory of a baseball, and the behavior of things we experience everyday. However, the laws of quantum mechanics apply in the nano-world. The operation of computer chips in present-day computers can be explained by the laws of classical electron flow; but when electrons are confined to nanoscale dimensions, they behave according to the laws of quantum mechanics. Consequently, future chips made with nanoscale dimensions (called q-bits) will process information differently and lead to computers with new logic and functionality. Similarly, materials formed from nanoscale grains can exhibit dramatic property improvements, and drugs at the nanoscale can become more effective with fewer side effects. 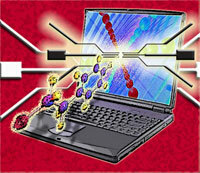 Nanoscale science strives to understand these changes.